After returning to our friendly Doreaki vendor in Silom and successfully negotiating a cooking lesson for the following Monday we decided to head over to Sukhumvit for lunch. We are pretty comfortable over that way as we stayed a week there last visit and it is where most of the expats live and work. When we stayed there last we mostly ate at the amazing Soi 55 which is a side street that comes alive of an evening with street food vendors everywhere. 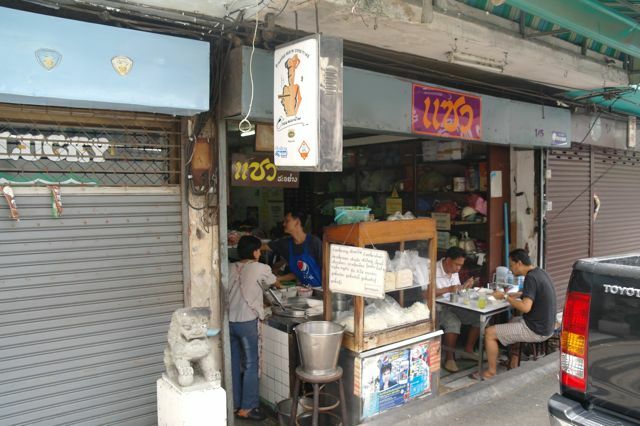 It also works like a pseudo drive thru as a lot of people drive down the soi and order takeaway from their car. As is usually the case when I'm looking for somewhere new to try I turned to the most useful travel book I've ever bought. 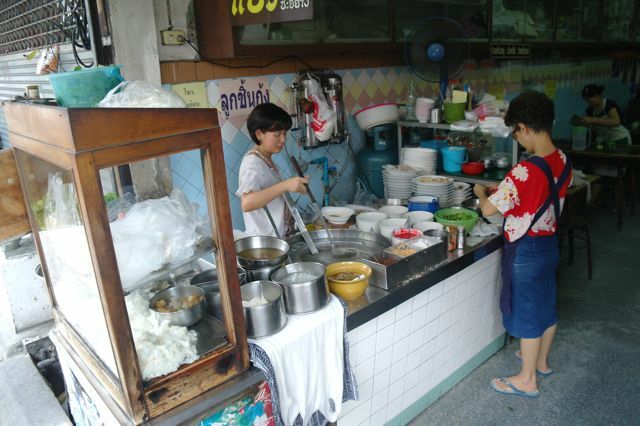 Bangkok's Top 50 Street Food Stalls by Chawadee Nualkhair from Bangkok Glutton. Another reason we were in Sukhumvit was that I had read the Kinokuniya bookshop in the Emporium had a few copies of the out of print Good Eats Rattanakosin food map that was highly recommended by the very reliable Austin Bush in an article on CNNGO. You can read his article here, and yes I have all of them! Saew is about a 15 minute walk from the Phrom Pong BTS station that adjoins the Emporium and as we were feeling pretty good after a nice dose of air conditioning we decided to walk and see if we could find it. I have to say that Chow has never steered me wrong when it comes to food but directionally she is a bit hit and miss so we were delighted to find Saew with minimal fuss. I wandered in and grabbed a table while holding the book open at Saew's page which turned out to be very useful as Chow has the three specialty dishes pictured and the waiter pointed to my book and asked if I wanted all three. Ah, that would be yes kawp kun krup! This one (above) is a dry wide egg noodle tom yum soup. I know dry soup sounds a bit weird but I think that's how it is described. 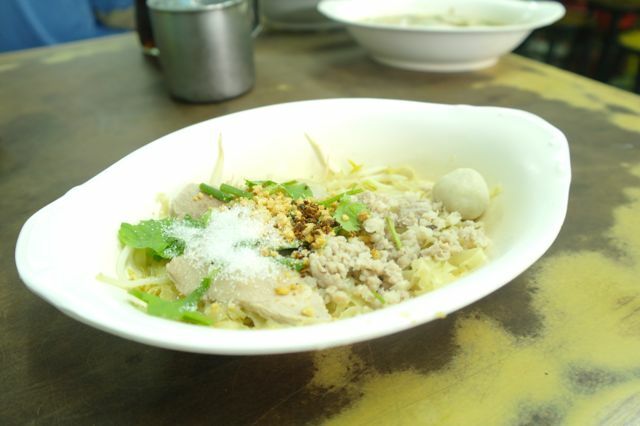 The wide egg noodles are bamee ban and they are awesome, I'm definitely an egg noodle man when given the choice. This dish is Tom Yum with pork and thin egg noodles (bamee glom) and was also fantastic. This was my favourite of the three. The tom yum soup here is much subtler than I've had back home, you will notice that the broth it isn't that bright red colour that you often see. 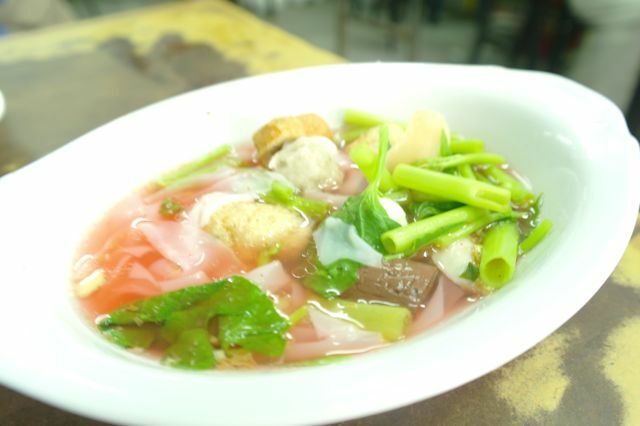 Speaking of brightly coloured broth, the last dish was Yen Ta Fo which is wide ribbon rice noodles in a vivid pink (si chompuu) broth. I remember reading that traditionally the pink colour comes from a natural source (I can't remember what) but these days food colouring is more commonly used. The pak boong (morning glory) seems to be very widely used over here, also popular is pak kanna (chinese broccoli/kale). This is an interesting dish and definitely worth seeking out but to me it can't compete with the stars of the Thai noodle soup world, kuay tiao rua, kuay tiao moo, kuay tiao gai and of course tom yam!